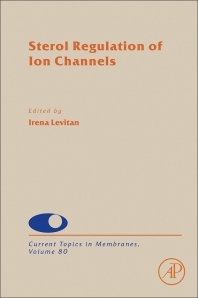 Sterol Regulation of Ion Channels, Volume 80, the latest in the Current Topics in Membranes series provides outstanding content to the scientific community on relevant topics that relate to the broad field of membranes. Topics of note in this new release include Membrane structure and general mechanisms of sterol regulation of ion channels, the Regulation of ion channels by sterols as boundary lipids, the Differential effects of sterols on ion channels: specific vs. non-specific interactions, the Structural determinants of cholesterol-ion channels interactions, and the Regulation of Ca2+-sensitive K+ channels by cholesterol and bile acids via distinct channel subunits and sites, amongst other specialized chapters. Irena Levitan, PhD, is Professor of Medicine and Adjunct Professor of Pharmacology and Bioengineering at the University of Illinois at Chicago. Her current research focuses on cholesterol regulation of ion channels and cellular biomechanics. She published more than 70 papers and book chapters and is a recipient of Guyton Distinguished Lecturer award for quantitative and biophysical work on cholesterol modulation of ion channels and how this can affect integrated organ function from the Association of Chairs of Departments of Physiology.